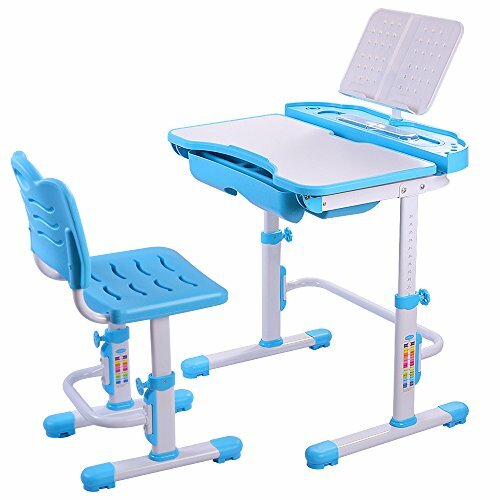 Ergonomic Design: The ergonomically-designed desk and chair set afford a comfortable and right sitting position, encourage better posture and more range of kid's sight when working on any project. Perfect for growing kids. Height Adjustable: Both desk and chair are height adjustable to keep up with your fast growing kids. The desk can be adjusted from 20.5"(52cm) to 30"(76cm);the seat of the chair can be adjusted from 11.8"(30cm) to 17.7"(45cm). Can easily satisfy children at different age. Tiltable Desktop: The desktop can be tilted from 0-55°angle to satisfy different needs for doing homework, reading, writing and drawing, prevents kids slouching and promotes healthy posture. Anti-fall stopper prevents objects from falling while tilted. Smart Storage: The cubby under the desktop is perfect for storing stationeries, books and papers. Embedded groove on the desktop holds pens and pencils. A handy side hook helps hold school bag and cup holder. Tiltable Bookstand: The slot-in bookstand can be tilted and provides the ideal reading distance from the seated position for books or a tablet. If you have any questions about this product by Nidouillet, contact us by completing and submitting the form below. If you are looking for a specif part number, please include it with your message.